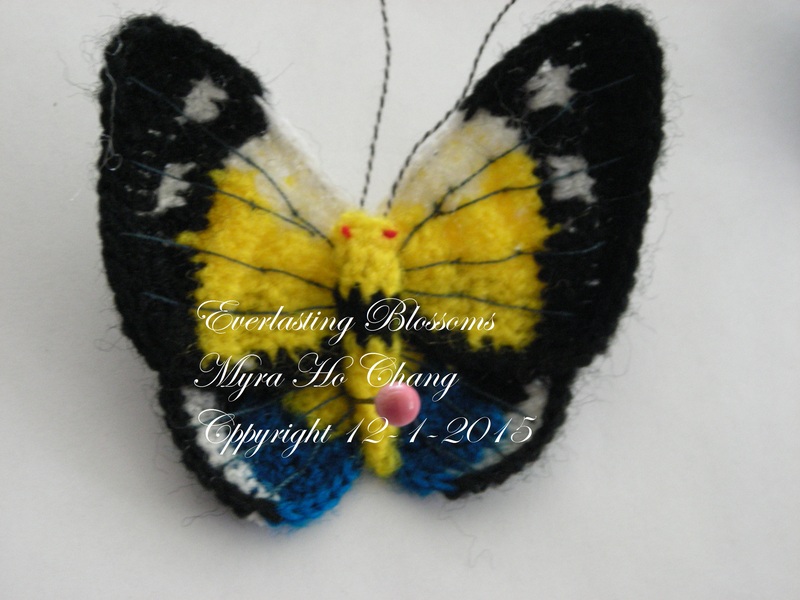 There were two stages of the butterflies my mother crocheted. 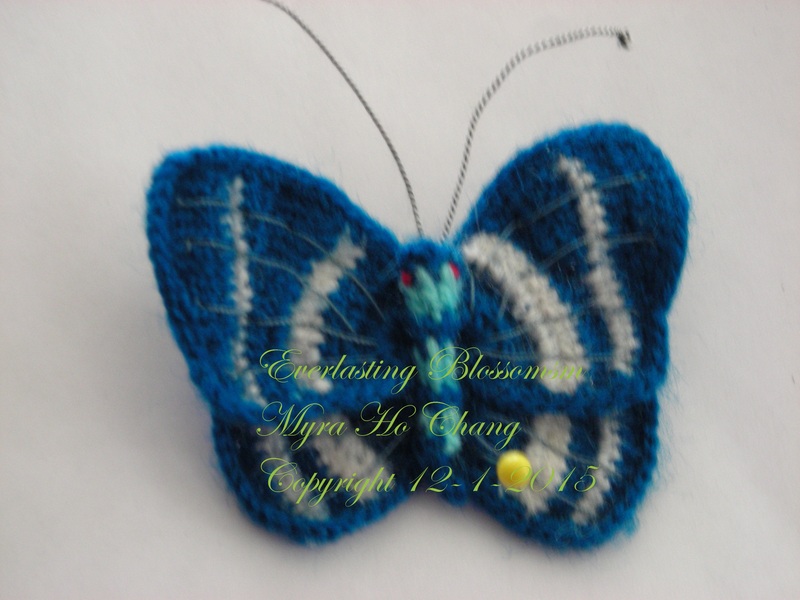 The first ones were crocheted with very fine yarn as the pictures showed above. Unfortunately, the export business embroiled into his partner’s bankruptcy and lost almost all his fortune. He had to stop the butterflies business completely. But he was faithful and a man of honor, even those products means nothing to him now, but he paid off all the labors without any deficit. My mother was very grateful to that businessman’s faithless. When those service family member found out what had happened, they felt so sorry for the businessman who had involved in such misfortune. 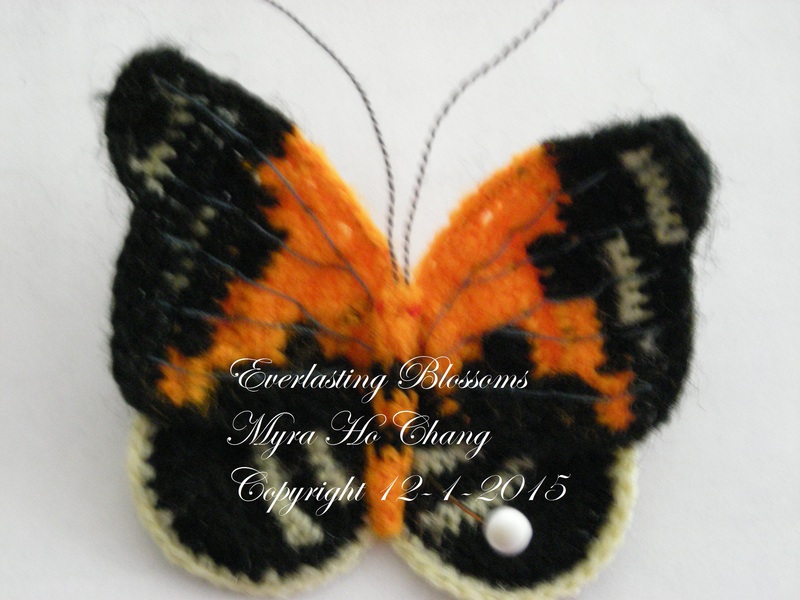 In addition to Everlasting Blossoms bonsais, my mother also crocheted butterflies in order to decorate her garden. A similar bouquet was presented to Professor Sye. 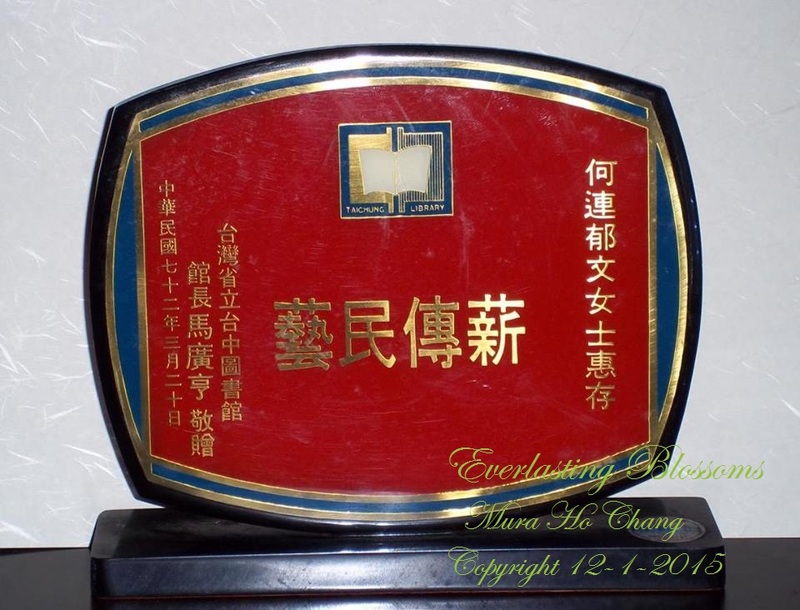 All the pictures posted in this chapter were taken by the visotors who mailed to Syau Wen afterwards. Professor was very fond of arts You would see many art works in her home. In addition to those Chinese Paintings and calligraphy, there was a black ink painting of Mr. Feng-Dz-kai. Mrs. Li-Shu-Syan embroidered a colored picture of Professor Sye, dressed as a woman soldier in when she was young, looked dashing and spirited. The show room was on the third floor. There was no elevator, which would make people very tired from climbing those stairs. Besides, Elderly Professor Sye had a leg surgery some years ago. But none of these would hinder her visits. Each time after she struggled up to the showroom, she was almost breathless. And each time she came would bring some friends of hers. Happily she showed them what she had found. 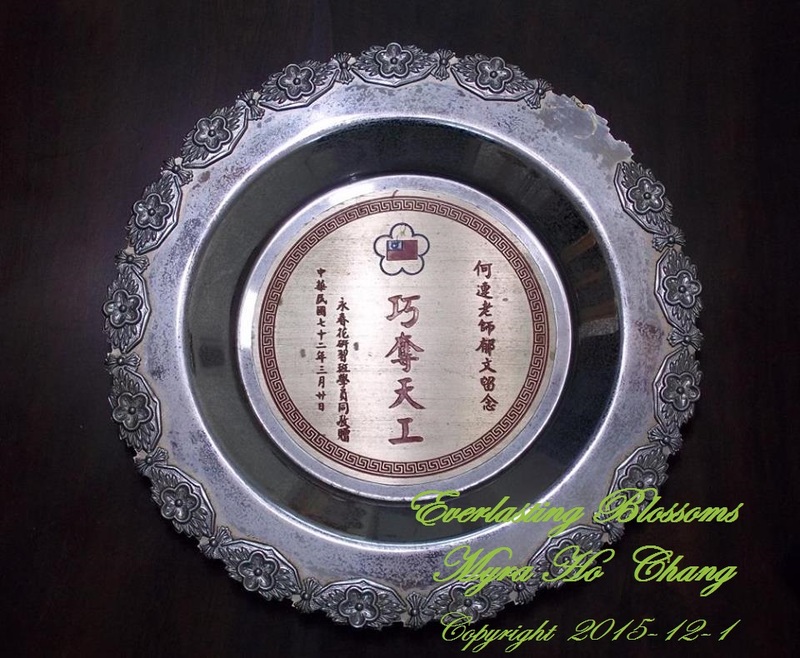 Thus Everlasting Blossom had a chance to meet Poet Shu-Man-Sya, famous Novelist Fan-Lu, artist Chen-Syu-Ying and an Air force Writer Jang-Tau. 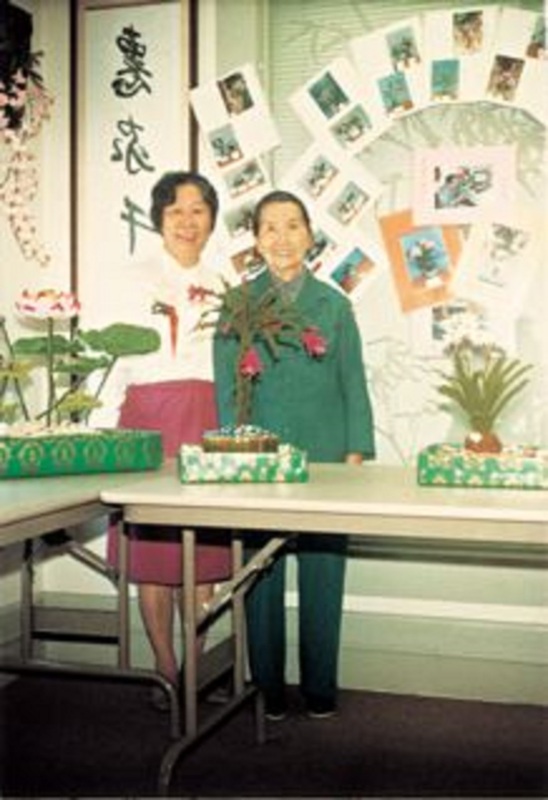 Since 1968, four years after the very first rose was born, Yu Wen’s children had arranged many exhibitions for her from Taiwan to California, USA. 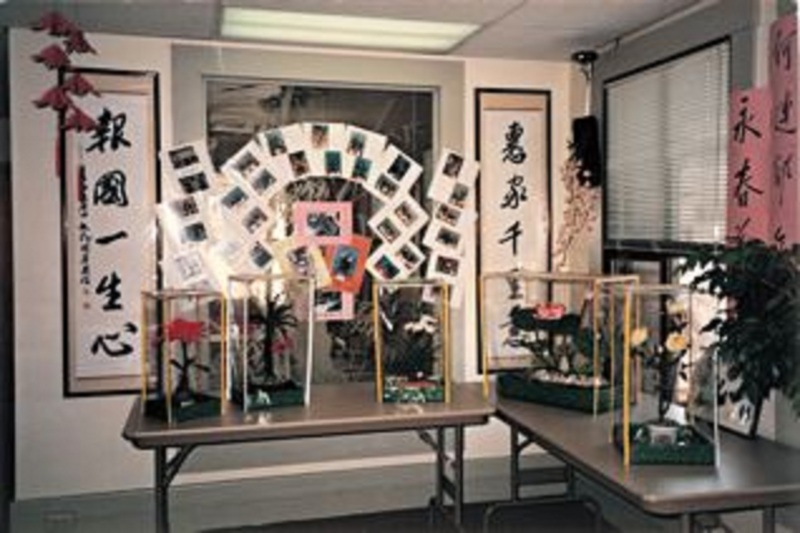 1974, the first big exhibit at Tai Chung Main Library, Taiwan, Everlasting Blossom started meeting with new friends brought lots of good comments and praises. 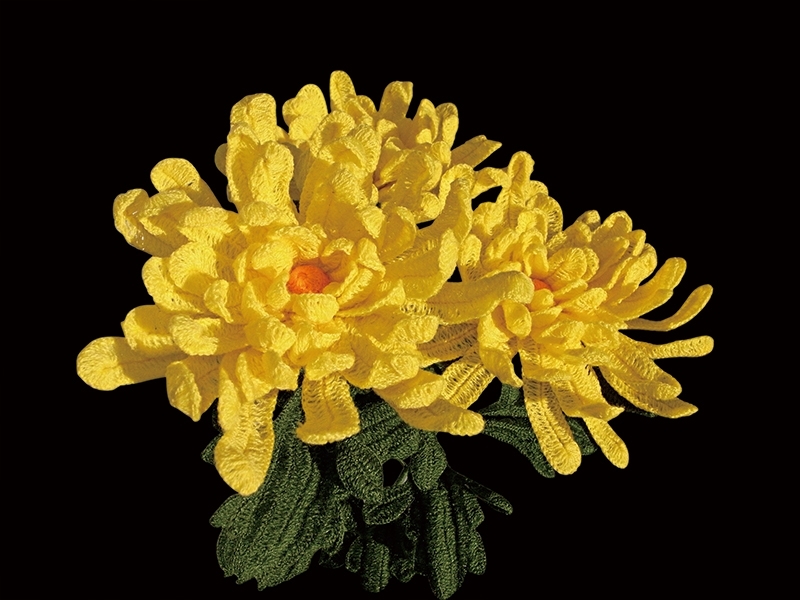 Amount all the Everlasting Blossoms, Spider Chrysanthemums were the ones that Yu Wen had spent the most time to crochet those petals. There were almost 200 petals in each flower. And they were in six to seven different lengths! Every petal must be supported with a very fine copper wire, so it will be stiffer, yet not as stiff as like sticks . You can shape those petals the way you wanted to. Therefore the whole flower will look like if they were growing in the garden. To organize the petals evenly on the stem is another ordeal . 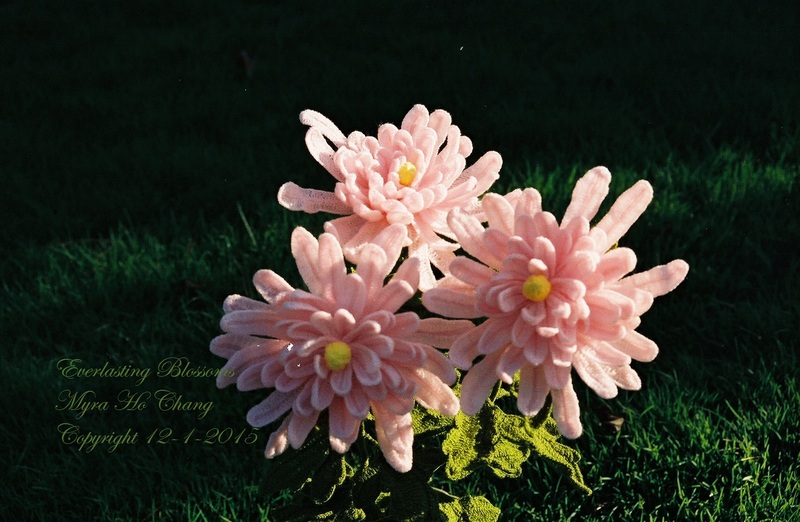 Yu Wen crocheted different kinds of Chrysanthemums because she loved them specially for their unusual spirit. They are beautiful yet not brightly colored. Their unique faint fragrance. 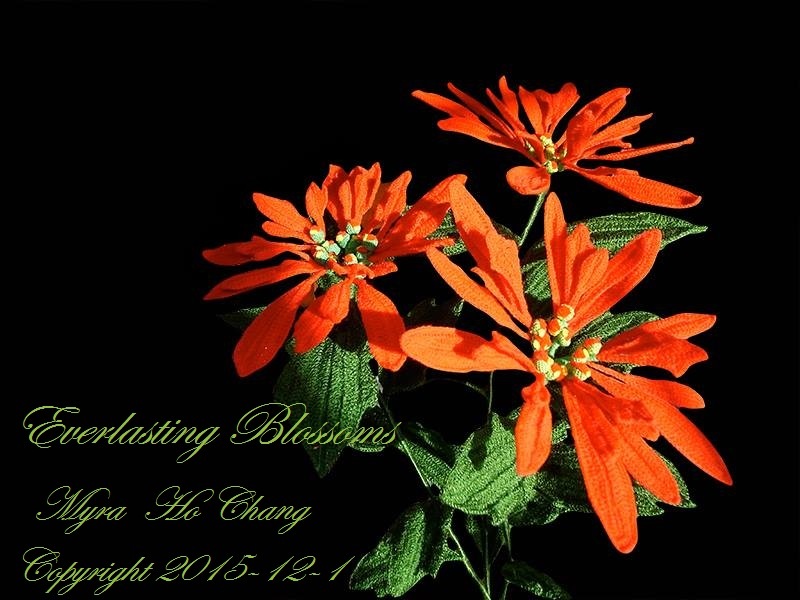 They blossom in cold winter. Snow and the freezing frost would not stricken them. 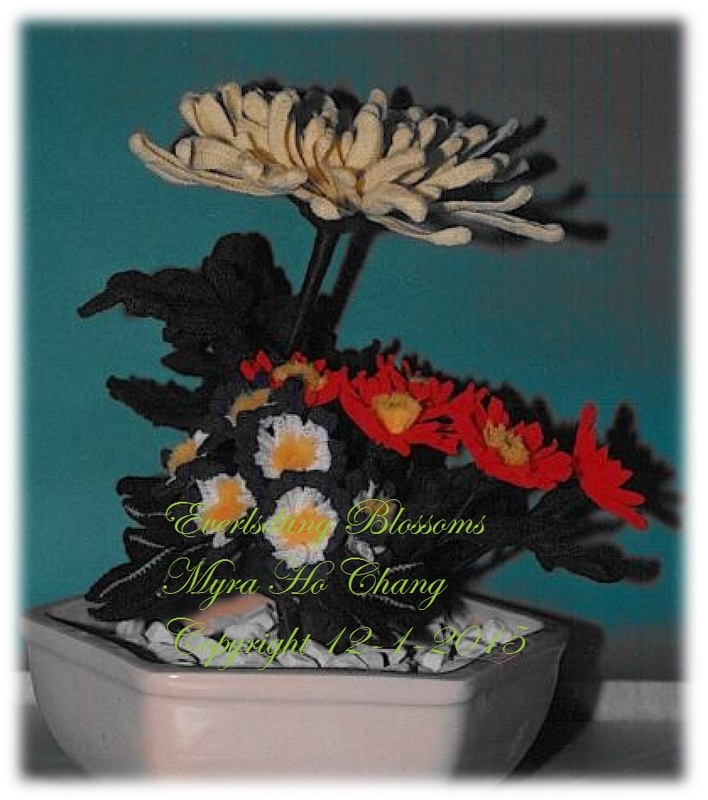 Chrysanthemums were favored by many Chinese poets. 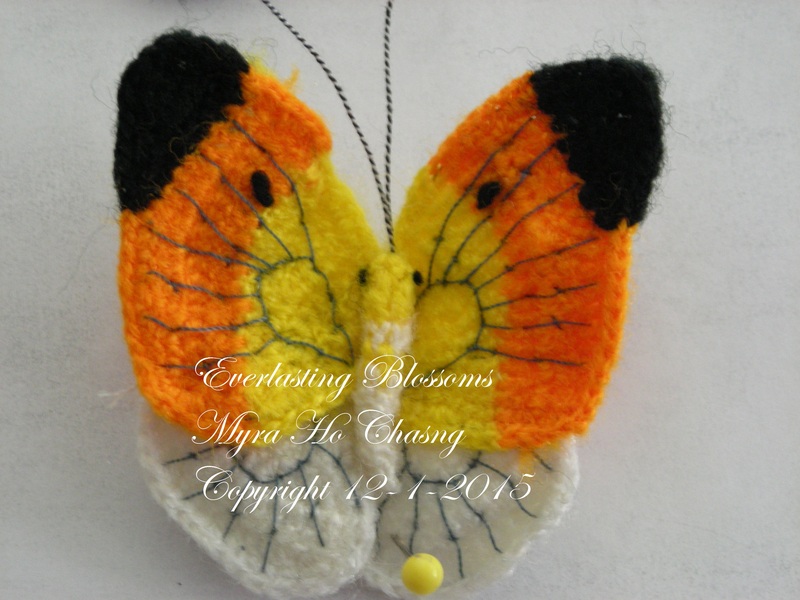 C-39 Meeting friends with flowers–is on its way! 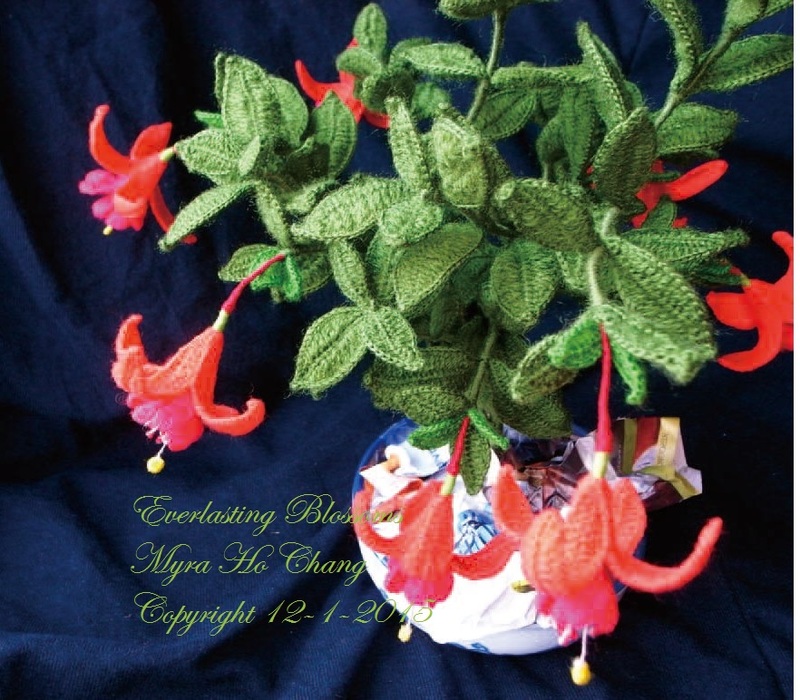 This visit made my mother got the yarns and the hook out of the drawers and crocheted the Bellflowers, The first bonsai since my father died. 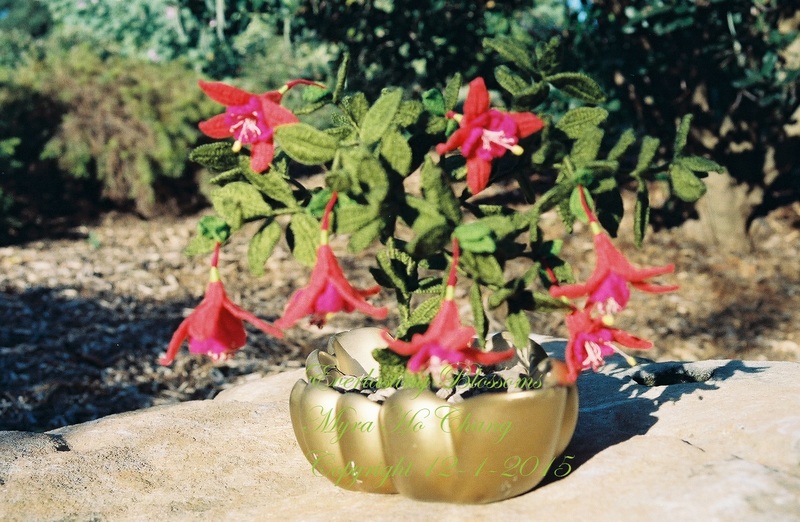 And then, the Christmas Cactus, the third, the fourth…….much. more new ones were born. 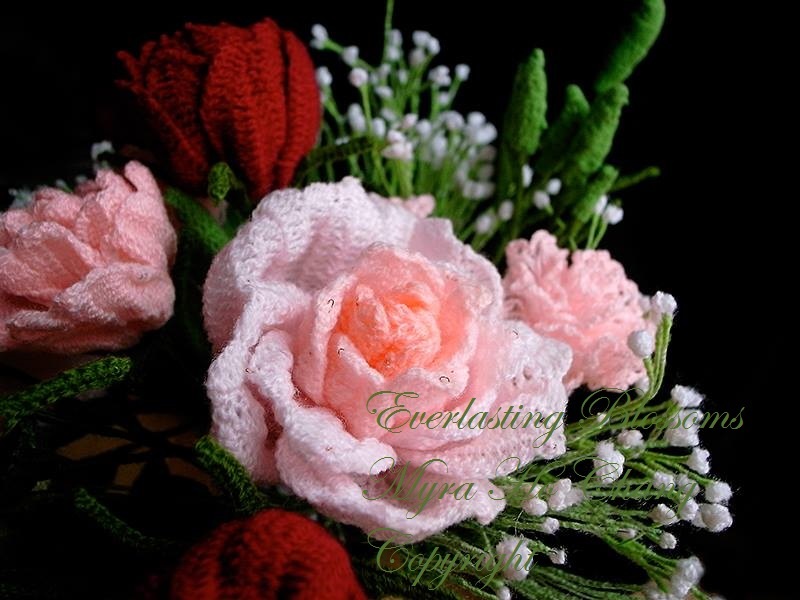 The motivation for my mother to crochet the flowers was based on my father. But 1988,my father passed away after the stroke. The pillar of her life suddenly collapsed. She completely lost the interests of crocheting. All the yarns and crochet kits were put away. One day, my sister-in law came home in a very joyful mood. 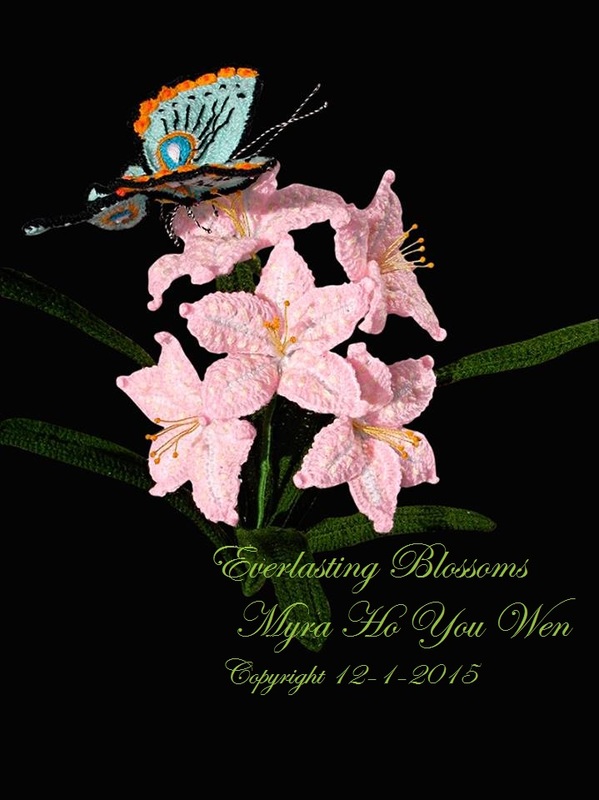 She told my mother that on her way home from the market, she passed by a flower store, the owner was a fan of Everlasting Blossom, invited her into his store and introduced her some new flowers which he had just purchased and asked if her mother-in-law would be interested. My mother was not interested at all. I apologize that I posted the wrong name for Gladiolus as Bellflower. The following chapter – C-35. 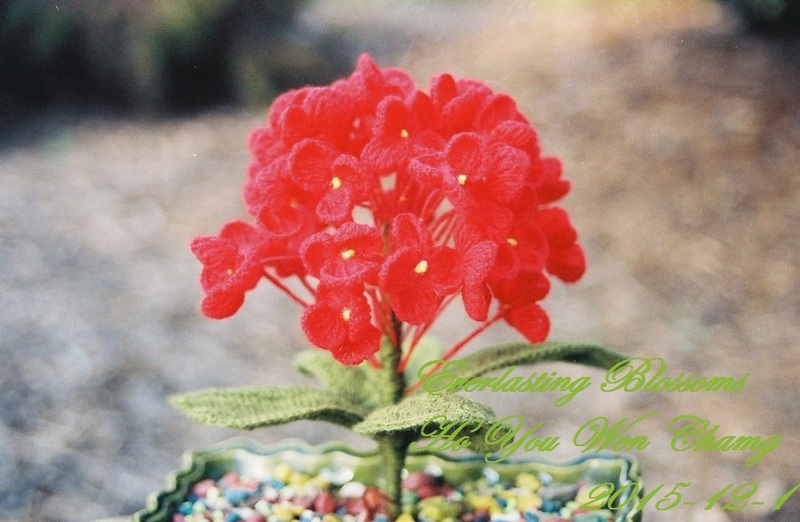 The Bellflower- will be posted right now. While the Everlasting Exhibition was held at the Tainan Folk Culture Center, in Taiwan, Mayor Su Nan Cheng cut the ribbon for the opening ceremony. He was the very first distinguished visitor of the exhibition. My mother presented Mayor Su a vase with Gladiolus in it, similar to the ones as the picture shows in this page. 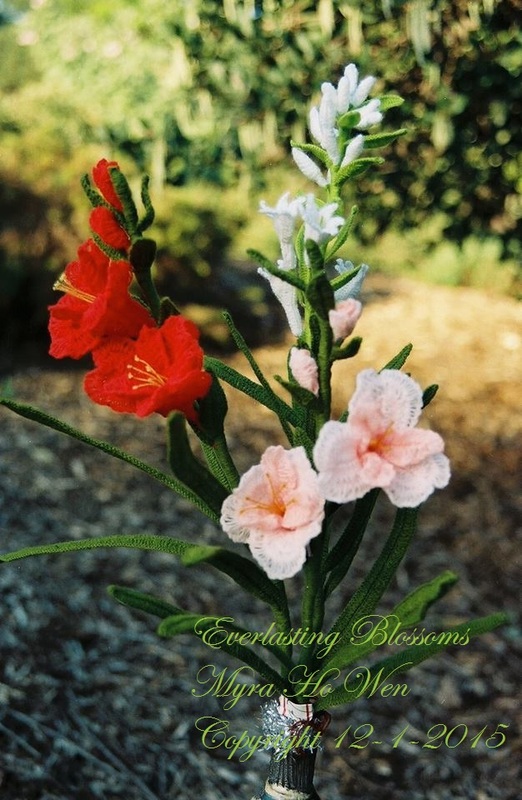 Gladiolus symbolize “blessing” and “Good luck”! Once a middle aged lady supported an old gentleman with her hands slowly walked into the showroom. The lady said they were from Jang-Hwa. They walked slowly around the table looked at every showpiece. After he praised Yu Wen for her unique exquisite hand works, the elderly gentleman said he would like to paint something for Yu Wen to show his appreciation of what he have seen that day. But there was no painting paper nor painting brush and ink. Syau Wen said to him if he wouldn’t mind waiting a little while, she would go home to get some paint supplies. The old gentleman told Syau Wen he can wait. There was nothing important for him to do that day any way. Syau Wen rushed home on her bike, and brought back rice paper, ink and different sizes of painting brushes . 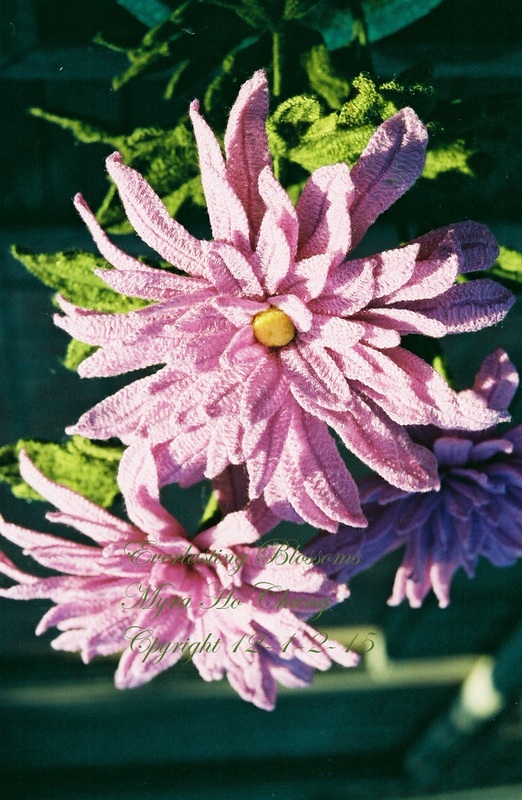 That elderly man painted some Chrysanthemums growing along the eastern hedge. He wrote five Chinese characters 采菊東籬下–*Tsai Ju Dung Li Sya– on the top right corner and handed it to Yu Wen. Yu Wen was overwhelmed! She understood that the painting and the writing were telling her how much this unknown elder gentleman was praising her works. Right away she hung it up on the wall in the showroom. The curator of the library saw that picture, he asked Yu Wen why didn’t she ask the artist to sign or seal his picture? It looked like the picture was done by a famous artist who lived in Jang-Hwa. If so his last name could be Hung. Who knows that this painting could worth a fortune if he had signed or sealed! *Tzai Jyu Dung Li Sya, is the first sentence of one of a the famous poem which was written by an ancient classic poet, Tau-Yuan-Ming. 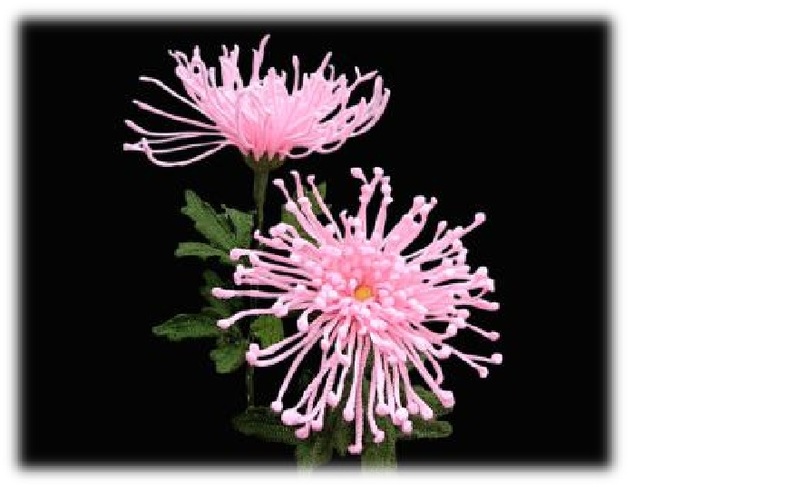 The whole piece tells that the poet left up his head while he was picking some Chrysanthemums, surprisingly he saw the amazing beauty of the South Mountain along the eastern hedge. 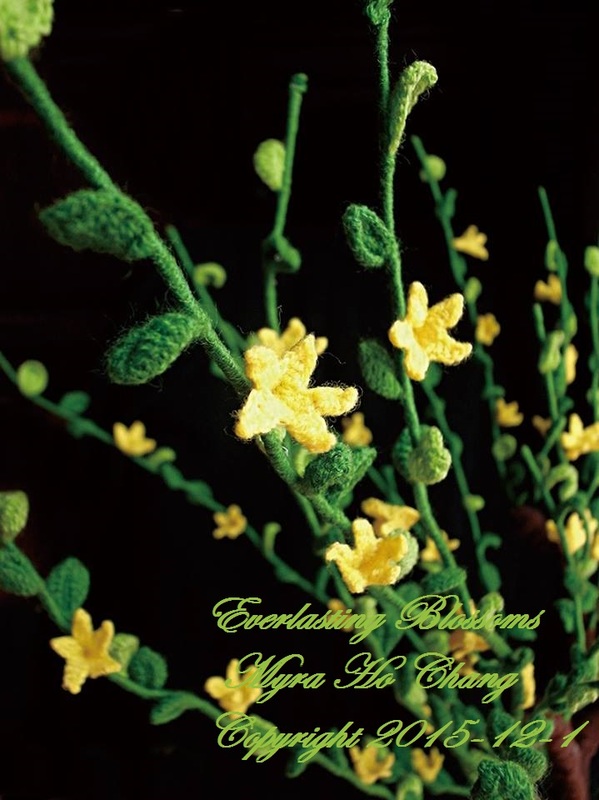 The elder gentleman wanted to use the Chrysanthemums as a expression to tell Yu Wen when he walked into the library that day unexpectedly saw these amazing hand crafts. The schools were on their summer vacation. Some of Syau Wen’s elder son’s classmates Volunteered to be the ushers. Their main job was to make sure that no one should touch any of the showpieces though the signs of “Don’t touch, please!” were placed on the tables in case some viewers can’t refrain from touching them. Yu Wen was around her sixties at the first exhibition. She was a little heavy and panted if she walked a little too long. But she walked back and forth in the showroom in that nine days. Explaining and answering questions for the visitors. She even walked down to the second floor to answer a phone interview of a local news. 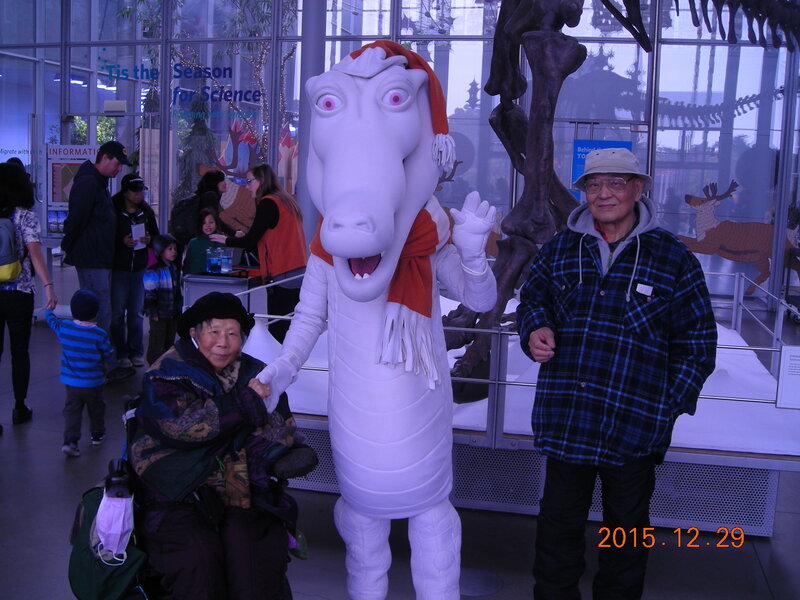 The great joy and happiness from her heart put smile on Yu Wen’s face, and she didn’t panted at all! In the showroom, it was always crowded in that nine days. One lunch break, Yu Wen and the boys were having lunch. A middle aged man walked into the showroom with bear feet. He was wiping his hands on his shorts! It looked like that he was just finished washing his hands. He looked as a famer who had came back from the farm land. Yu Wen stared at him in astonishment. She saw him slowly circled the show table from the first pot to the last one. Very carefully he looked at every one especially with those orchids. He came up to Yu Wen and said:” Granny! I counted the pistil and stamens, they virtually look as real as flowers.” The Curator of the library told Yu Wen that every one call that bear feet bizarre dressed man “Bear feet Celestial” who was an orchids expert. For some reason he had made a pledge to god that he would dressed up like a famer with bear feet in and out any public places. Syau Wen went home joyfully and told her mother about this good news. 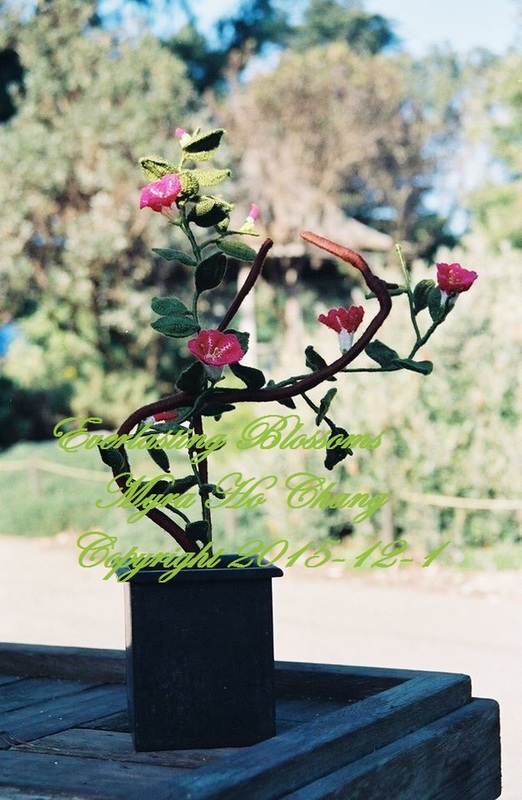 Yu Wen laughed and said: “I see, That was why your father took some pictures of the flowers! 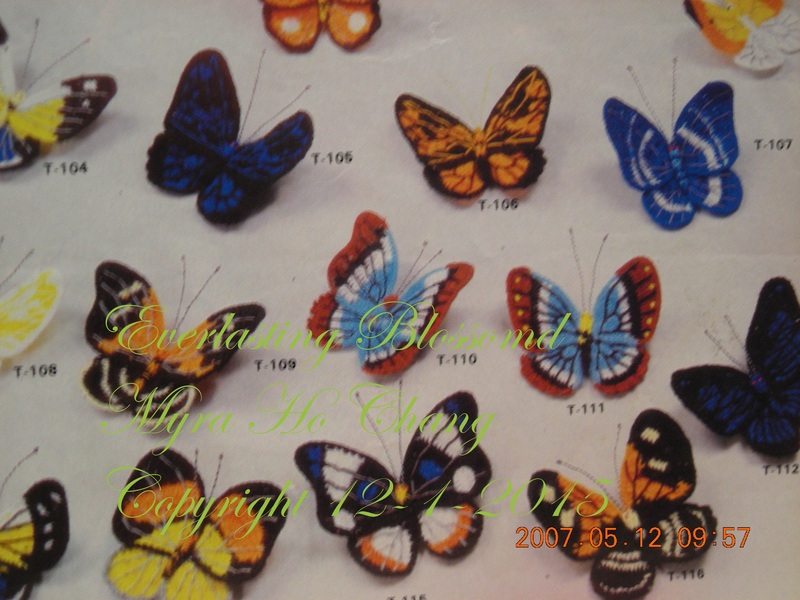 So, there is a Secret Agency in our home.” What Dz Yun and the children did brought Yu Wen sweet love which urged and encouraged her to crochet more. 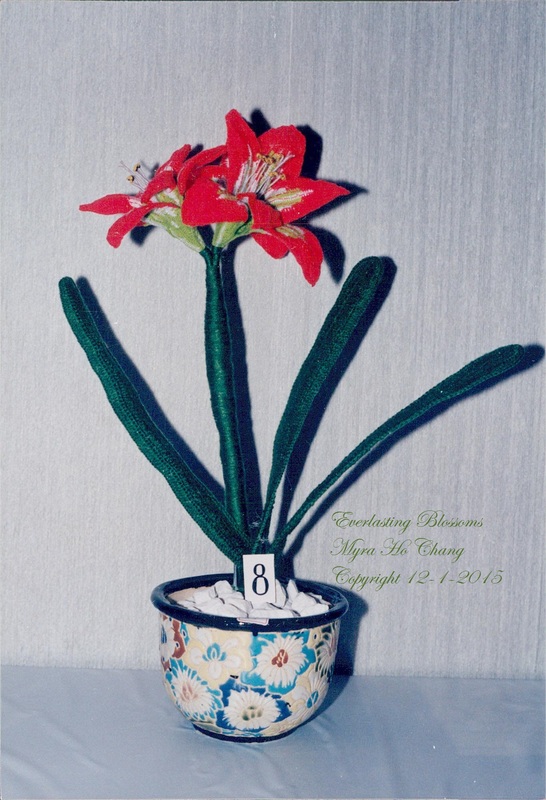 She told Syau Wen that she would like to have a nine days exhibition. 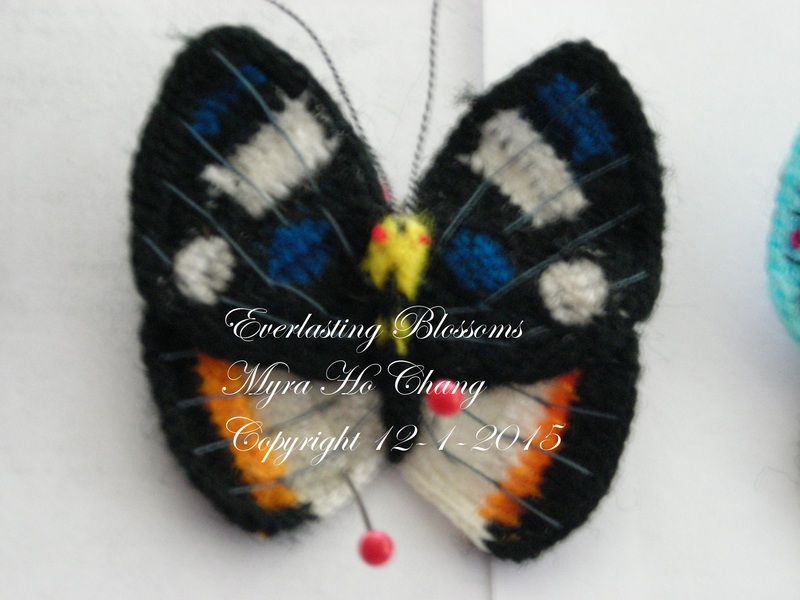 When the dates are booked, she wish to visit the locus to pre-plan how will she place her pieces. Syau Wen conveyed the massage to the library office the very next day. Just in a few days later, they received the notice from the library that the nine days of exhibition were set in that summer. 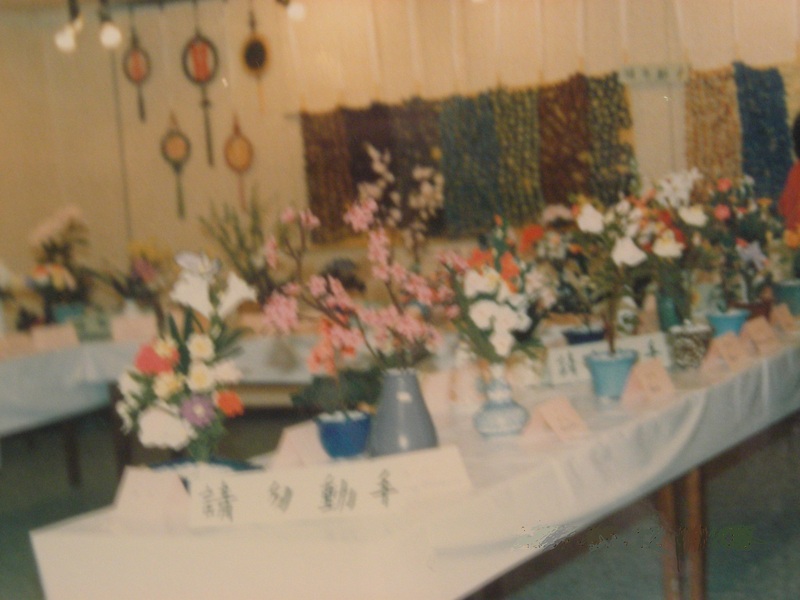 A very large room was assigned for “Everlasting Blossom Exhibition”. For the visitors to have a good view of everything that placed on the show tables, Yu Wen arranged the tables in a “U” shape. People can walk around and see every side of the showpieces. “We would like to hold an exhibition at your library if it is possible.” Syau Wen said uncertainly. “I really do not know. But they are a kind of art, I’m sure” Syau Wen handed those pictures out to the lady as she was saying. 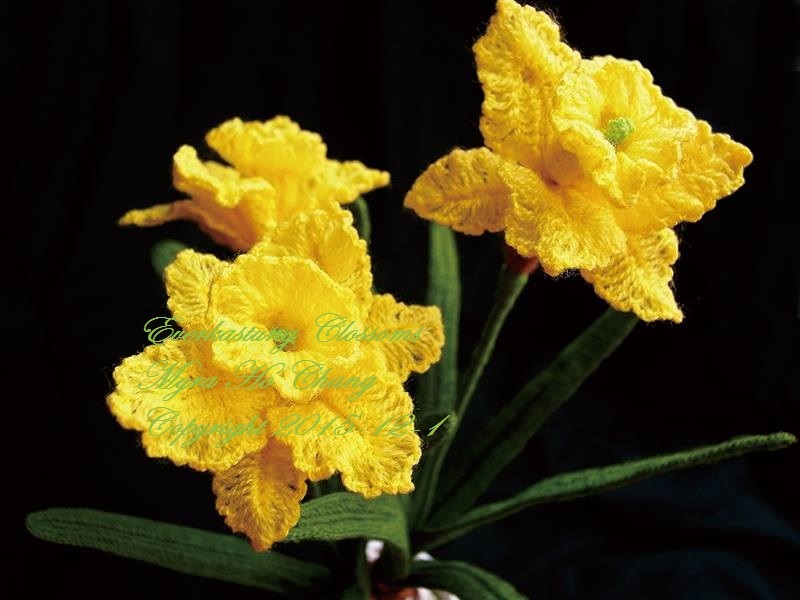 ” My mother crocheted many these kind of flowers. They were all done with my mother’s hands. Except the vases, pots and pebbles, “Really?” With the pictures in the lady’s hands, she walked over under the light. She was amazed when she looked at them closely. ” Please wait here, I’m going to show them to our manager. Syau Wen sat in the chair anxiously, she didn’t know what will be next. Not too long a middle aged gentleman came out from his office with those pictures. Syau Wen assumed that he should be the manager and she stood up. Yu Wen’s children, five of them, all thought keeping their mother’s beautiful art craft at home would be the lamp under the bed. It should be placed on the table to lighten up the whole room. And the light should be shared with others. They thought the library would be the most appropriate place. 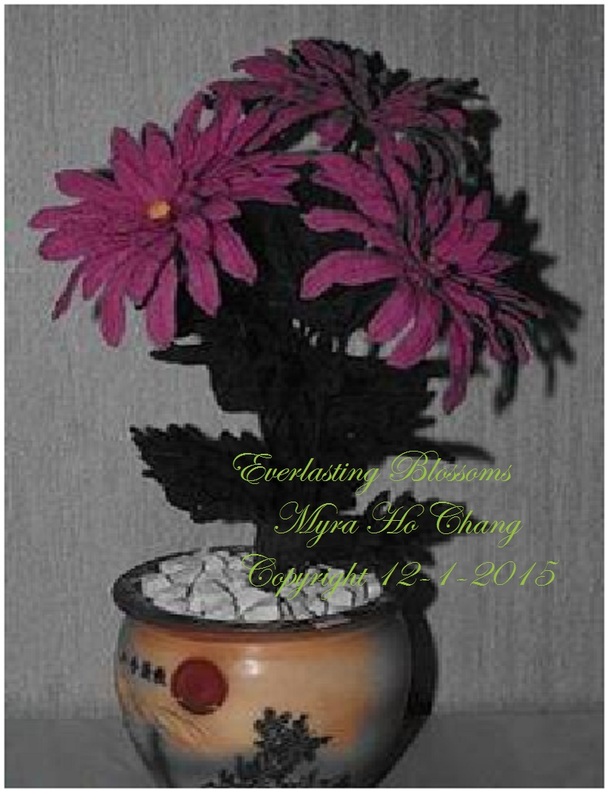 It’s the place for all kinds of flower arrangement show, sculptures, painting and calligraphy exhibits. Dz Yun was an outstanding amateur photographer. 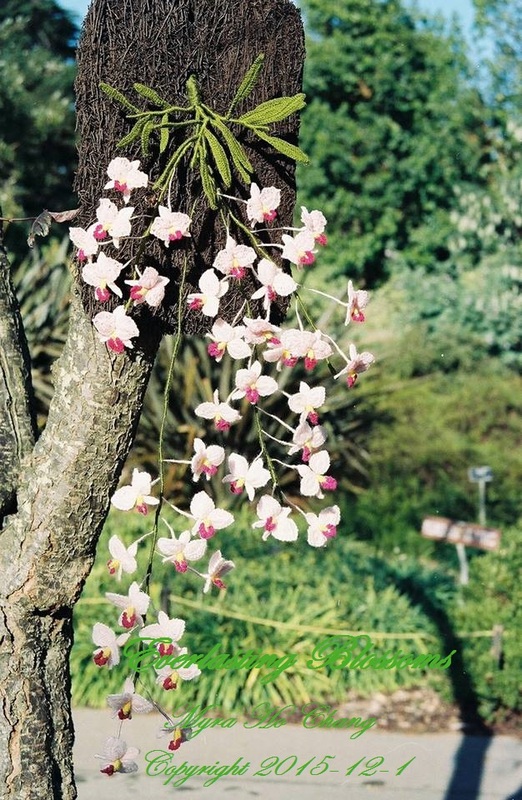 He photographed his most favorite Nasturtium, Luxuriant Bonsai and Dendrobium for Syau Wen to show to the library. All these activities were working in secret. They wanted to surprise Yu Wen. If the request should be rejected, it wouldn’t hurt Yu Wen’s feelings. They were a little hesitated, because Yu Wen’s works were neither life flower arrangement nor painting, calligraphy or sculptures. 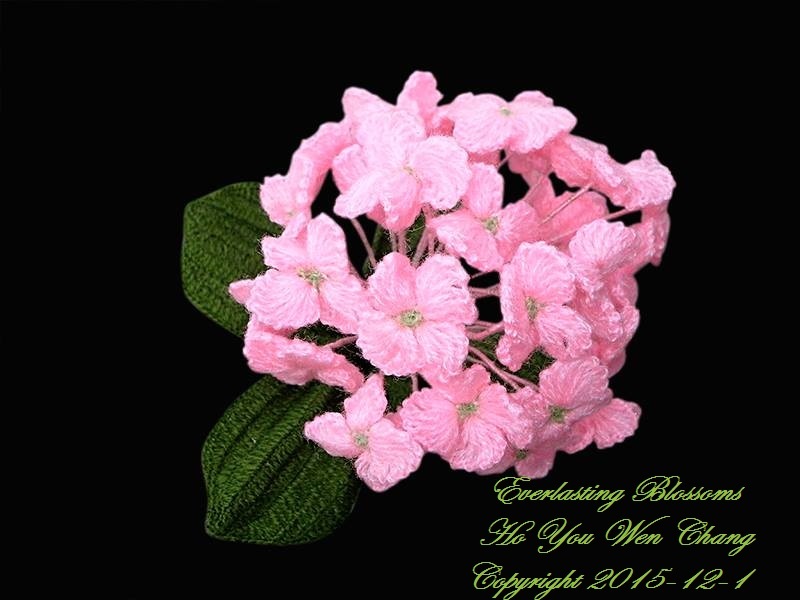 They didn’t know which category Everlasting Blossom would be fitted in. Yet those pieces were truly a different kind of art. 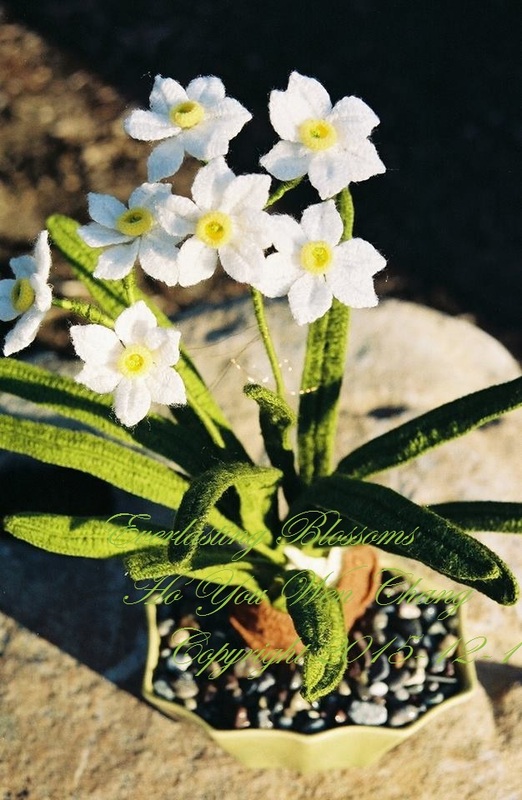 The white Chinese Narcissus have a very sweet fragrance. They possess a kind of natural grace and noble manner. It’s a pity! The roots and the stems were crochet with wire to support them, they would be rusty if you put water in the pot. Otherwise if there is water with those pebbles in the pot, it will look more like a life bonsai. This was the very first time that I ever touched a crocodile! I didn’t know that they were so soft and awfully friend! May be it was because this one was a white alligator!? So, I know what to do if I will be left in the swamp! Did you know those reindeer who pulling Santa’s slide were female deer? I’m proud of them! I’ve just learn it today. I learned that only female deer got antlers on in winter! 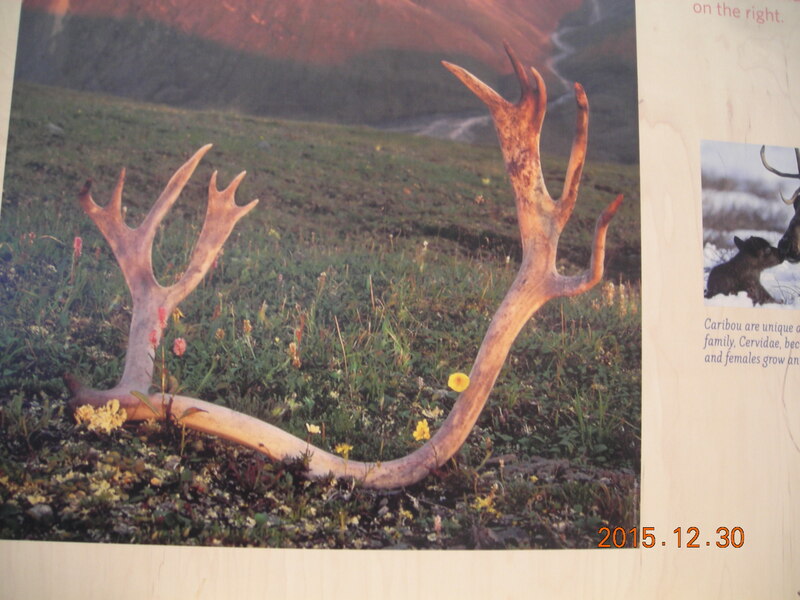 Could you tell if this antler was drooped by a male of a female deer?